Any part of an image that does not represent the anatomical structures present in the area being examined. 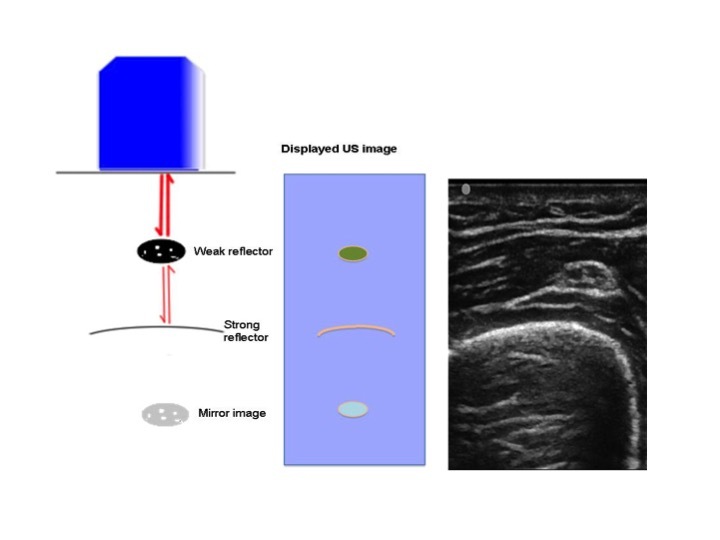 Ultrasound relies on physical principles to create that image and each part of the process of image production may be accompanied by errors. The US image is created by pulse formation, propagation, attenuation, reflection and echo detection, only some of which are user dependent. 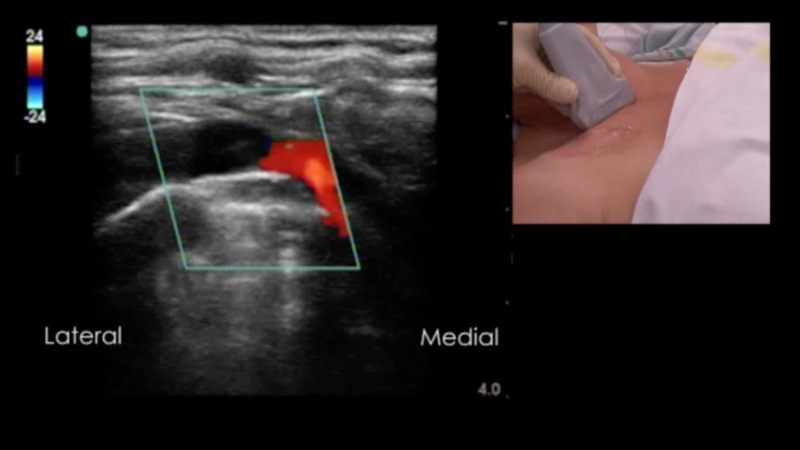 An understanding of the way in which ultrasound images are generated is important if one is become expert in its use. Artefacts are the result of a failure of Ultrasound to conform to the physical assumptions made in interpreting returning echoes. 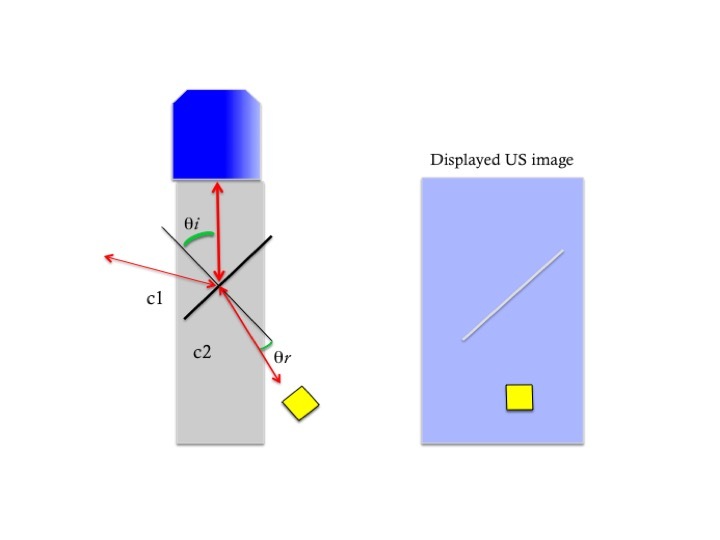 The processing computer in the US machine believes that returned echoes are the result of only one beam of minimal width, and of defined shape. Unfortunately this is not true. The beam can be divided into three zones, the near field or Fresnel zone, a focus zone, and the far field or Fraunhofer zone. The near field depth is dependent on frequency (f) and transducer radius (R). Figure 1. Side lobe artefact. Echo from a strong reflector in the side lobe is positioned as though it was within the main beam. Higher frequency transducers have a greater Fresnel zone depth. Beam divergence occurs in the far field and is controlled by a focusing lens in the probe or electronic focusing. Some machines have a user selectable focus and it is therefore important to set this at the target depth. Where there is no independent control of focus, the focus is automatically set for the depth at the centre of the screen. The main beam is assumed to be the only source of echoes, but crystals often possess multiple side lobes and grating lobes. A reflection from one of these will be placed as though it originated from the main beam. This is known as a side lobe artefact. These are usually weak echoes only seen within areas of low echogenicity such as blood vessels, bladder or cysts. As these lobes are of lower energy, changing the insonation angle or reducing gain will eliminate them. Divergence angle (degrees) = 70 f / D where D is the diameter of the transducer and f is the frequency. Figure 2. Beam width (lateral resolution) artefact. Grey area represents assumed beam. Note two reflectors the same width apart are combined as one in the far field, but only the red is seen at the focus zone. Axial resolution is the ability to distinguish two points above and below each other in the US beam. It is a equal to half the spatial pulse length; Spatial pulse length is the product of the number of cycles in a pulse or ultrasound and the wavelength. Most pulses are of two or three cycles in length. Therefore the ability to distinguish two objects in depth is improved with increasing frequency. Temporal resolution is of more concern in Echocardiography and is the ability to distinguish moving structures in time. Higher frame rates are possible with reduced depth and narrow frame width. See Ng and Swanevelder . The discussion above makes it clear that what we see on the monitor is very dependent on a variety of tissue and sound properties, and explains why changing frequency changes the screen representation of tissue. Low resolution images will therefore suffer from loss of information – a form of drop out artefact. The Transmission of sound through tissue is a function of acoustic impedance with air being notably poor at conducting sound energy. It is therefore important to eliminate air in the system. A probe artefact may occur due to inadequate coupling of the US probe to skin and is easily remedied with the use of acoustic gel or fluid. Acoustic gel should be sterile; 5% dextrose is a useful coupling agent particularly if nerve stimulation is used . As sound passes through the through the tissues, energy losses occur due to heat (80%), reflection and refraction as previously described. As the sound energy falls during passage through tissues the amplitude of returning echoes becomes smaller. In order to compensate for this, the machine progressively increases the amplification of reflected energy in an attempt to normalize the grey scale on the monitor. This is known as Time-Gain compensation (TGC). On many portable machines this is automatic or there are controls for near, far and overall gain. More versatile machines have a series of sliders so the user can adjust each layer independently. Failure to adjust these correctly leads to artefacts due to over-gain or under-gain in the image. Inadequate gain (Low energy signal) will result in a poor quality image with none or only very strong reflectors being visible. This is easily remedied by slowly increasing gain until a good image is revealed. As the sound energy levels are increased, excessive gain (high energy signal) results in increased “noise” from specular and scattering reflectors resulting in a white out. Imaging in areas with high ambient light levels often results in over-gain problems, and mirror artefacts, which can be eliminated in lower light levels. Always use the minimum amount of gain to achieve the desired image. Whilst there are few defined health risks from Ultrasound , we should use as little power as is reasonable. Post-cystic enhancement or distal enhancement occurs when the sound passes through a material with low attenuation. As the sound reaches the next reflector its energy is greater than expected for tissue due to the TGC applied in post processing. This results in a stripe of increased echogenicity beyond the material. This usually but not always indicates fluid and is commonly seen deep to water containing structures such as cysts, bladder or blood vessels. 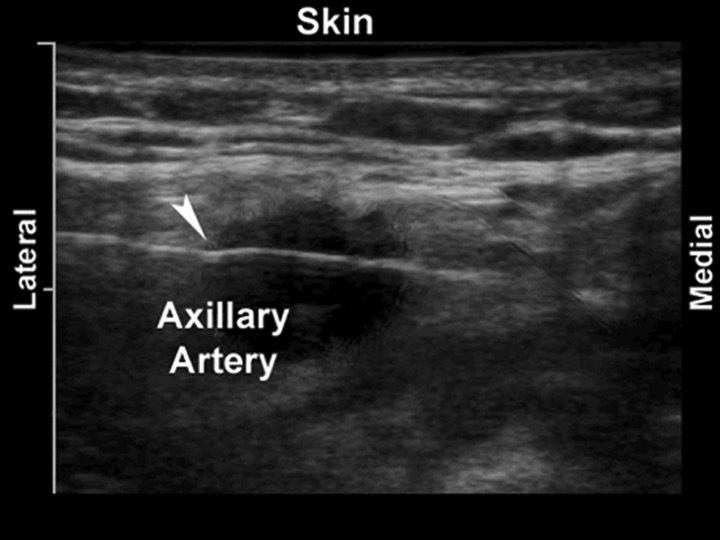 In regional anaesthesia practice this may be misinterpreted as a nerve particularly deep to the axillary artery in infraclavicular block. Figure 3. Distal enhancement. Note increased brightness deep to vessels. 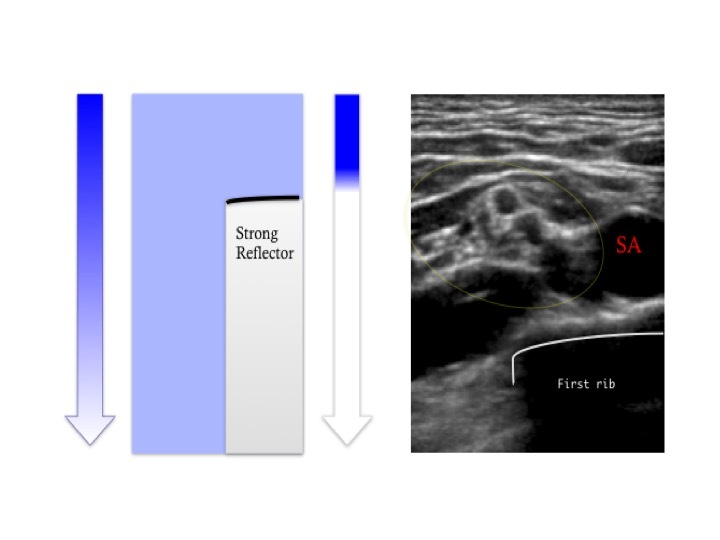 Acoustic Shadowing artefact occurs when the sound energy is reflected, rather than transmitted through tissue. This occurs with bone and air leading to dropout of information deep to the object. Probe repositioning may assist in viewing behind the reflector. It is used as an indicator of rib position in the supraclavicular fossa and assists in spinal imaging to determine the correct angle for needle placement . Figure 5. Reverberation. Reflection between two strong reflectors lead to multiple returning echoes at recurring time intervals which are placed in the image at a constant periodicity as a series of parallel lines. 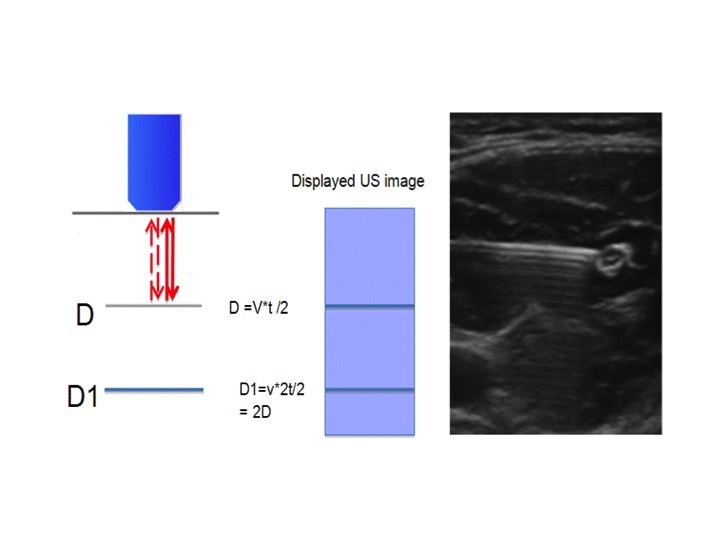 The US image to the right shows the reverberation artefact of a needle during block performance. US assumes that an echo returns once to the transducer and the time interval denotes its depth. When there are two highly reflective surfaces the echo may travel back and forward between the two multiple times resulting in a series of parallel lines at fixed intervals. This may occur between probe and reflector or between two reflectors. 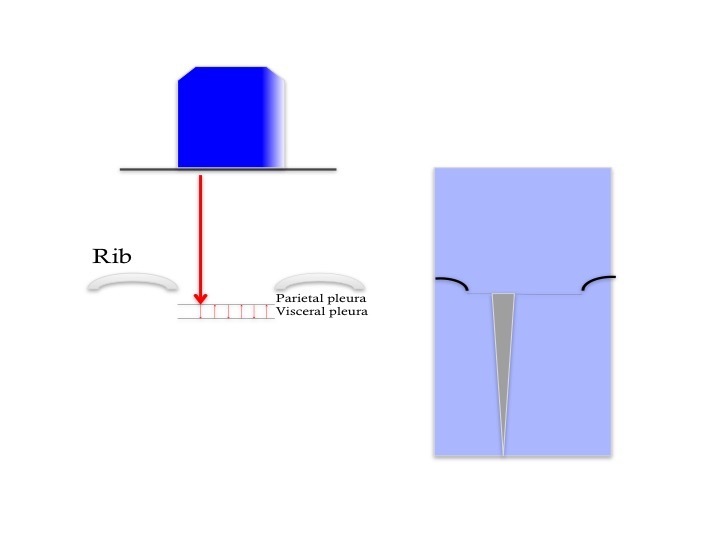 Needles imaged perfectly in long axis produce a pronounced reverberation artefact, a useful sign to confirm accuracy of needle position under the probe. Figure 6. Comet tail artefact. Reverberation in a thin layer produces a bright reflection of narrow width. Lung rockets or B lines are produced by reverberation in a cluster of four bubbles. They indicate thickening of the interlobular septa of the lung, and produce multiple bright lines, which reach the depth of the image as shown below. These are always pathological. Mirror artefacts occur when there is a strong reflector (e.g. Bone) deep to a weaker reflector (e.g. fascial layer). The image of the weak reflector is then displayed deep to the strong reflector due to the later timing of the returning echo. This is more likely to occur at higher gain settings and the artefact should disappear with probe angulation and reduced gain. Figure 8. Mirror artefact. Reflected wave produces mirror image deep to strong reflector. 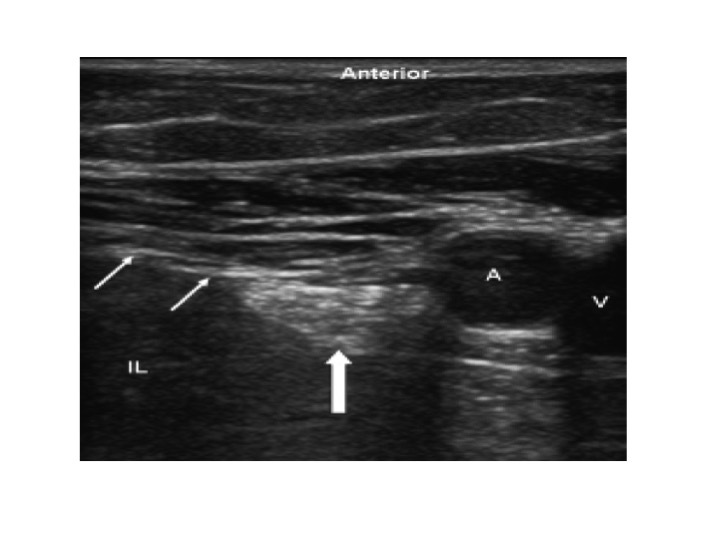 US image on right shows fascial planes mirrored in humerus. Specular reflection obeys the laws of physics where the angle of reflection is equal to the angle of incidence. The strongest echo and therefore image occurs when the reflector is at 90 degrees to the sound waves. This property is very important in nerve imaging where the nerve can disappear from view with small deviations in angle. This directional dependence is termed Anisotropy and is well seen for many peripheral nerves. When searching for a nerve, you need to be aware of the path it takes and angle the probe to find the nerve. For example the popliteal sciatic nerve follows the line of the femur and anterior thigh so that the probe should be held perpendicular to that direction. This means the probe appears to be pointing caudally as it rests in the popliteal fossa. 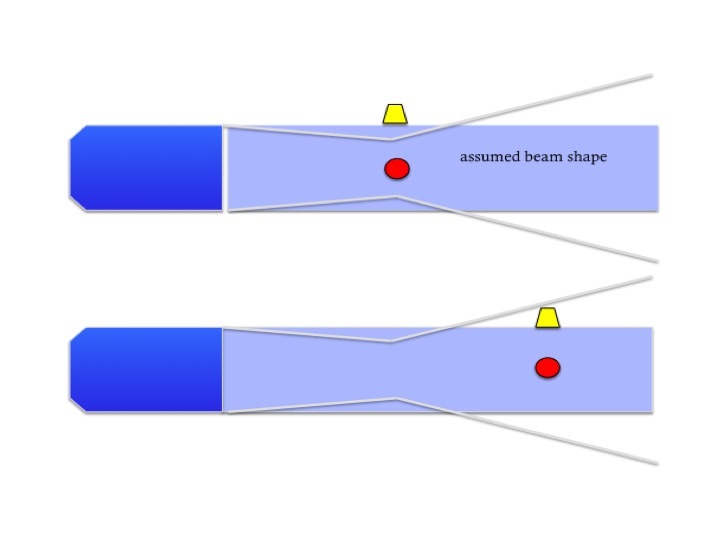 The refraction makes it possible for objects outside the assumed main beam to appear as though they are within the beam. Changing the beam angle will change the refraction angle and assists in recognition of this artefact. This artefact is readily also seen as Edge shadowing distal to a curvilinear surface. A common example is the shadowing deep to the edges of blood vessels. Figure 10. Edge artefact and distal enhancement around the femoral artery A.
Andrew Gray described the bayonet artefact  where he noted an apparent bend in a needle placed through the Axillary artery. 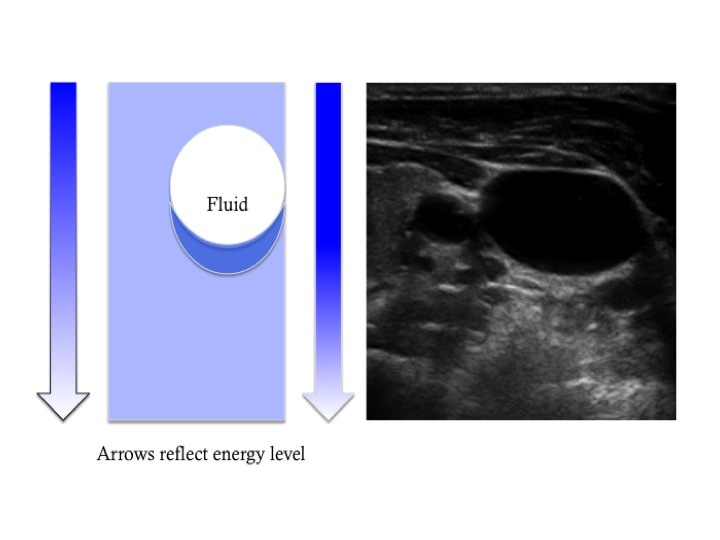 In this instance the speed through blood (water) is faster than through tissue so the returning echo is received earlier and placed nearer the surface. Figure 11. Bayonet artefact. Note needle appears to bend at the arrowhead. Interrogating the vessel at 90 degrees to flow (i.e. 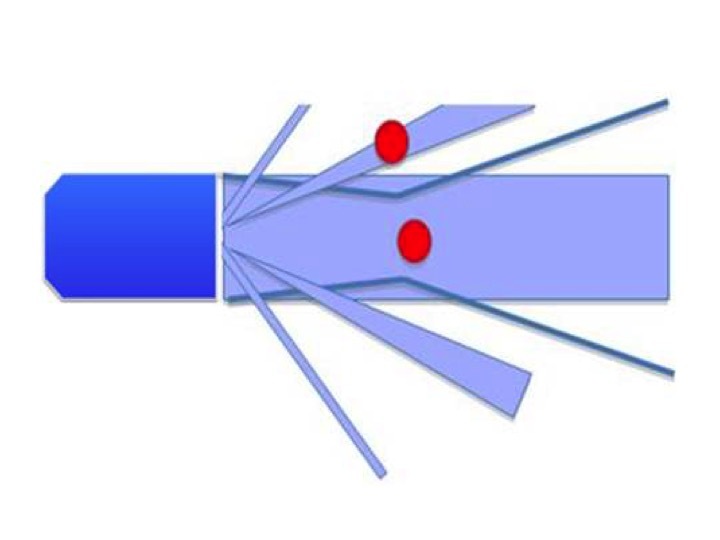 probe perpendicular to vessel) will not produce a frequency shift and therefore no colour flow indication since there is no movement of reflector (red cells) towards or away from the transducer. It is therefore vital that the probe is angulated in several directions to search for vessels in hypoechoic areas. Figure 12. Doppler artefact. 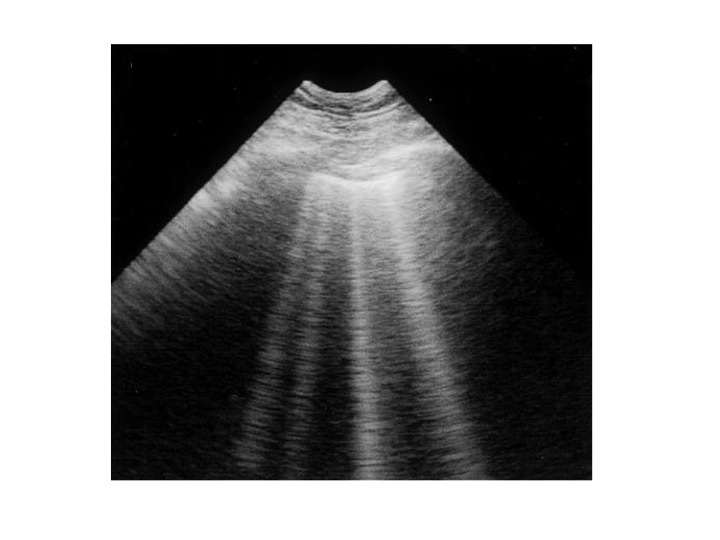 Note absence of colour over vessel where blood flow is parallel to the transducer.